Now you’re running a gardening business, you’ll need a business account. But what options are typically available? You can expect to find that all the major high street banks offer business bank accounts, but the finer points of each vary considerably. It’s helpful to do your research carefully and explore all the different options before choosing which one to go for. Although you may be tempted to choose the same bank as the one you already have personal accounts with, do try and compare the service offered by several banks before you decide. Even though you may have had great service and support from your existing bank, other banks may be better for small businesses. In addition, banks differ with the fees they charge to small businesses for their banking services, for example the fee for paying cheque's in. Many banks provide helpful advice and support for new businesses, in addition to the usual banking services. Plus, many banks offer special deals to start-up business, such as free business banking for a year, which can make a considerable difference when you’re starting out. What services do you offer to small businesses? Do you have a team dedicated to supporting small businesses? Do you have any special offers for new small businesses? What fees do you charge for paying cheque's in or other transactions? Do you offer overdraft facilities? 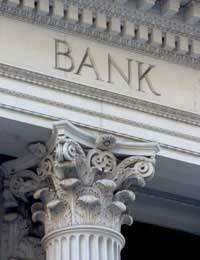 There are various different types of business bank accounts available. There are current accounts, that are ideal for the usual transactions and day-to-day dealings, and instant access deposit accounts, which are useful for depositing money that doesn’t need to be used on a day-to-day basis, but that you may need quick access to (such as savings for paying income tax). If you need to accept and process credit and debit card payments, then you may need a merchant account and if you’re taking out any loans, then a loan account may be required. The ability to access your banking online is a good addition to any account, especially when your business keeps you very busy and there’s not always time to get to the bank in person. Business accounts do come with various terms and conditions that you don’t always get with personal accounts, so don’t forget to be clear about what these are and stick to them. For example, if you have an overdraft, don’t exceed the limit without checking with the bank and definitely don’t become overdrawn if you have no overdraft agreed at all. Even when you have a business bank account for your gardening business, it’s still a good idea to keep an eye out on what other banks are offering and review your accounts every couple of years. For example, some banks offer competitive deals if you transfer an existing account to them and, if they help save you money in the long-run, may prove to be a better deal.